Learning through field courses requires confronting areas of missing or incorrect knowledge and consciously constructing a broader, more accurate understanding. As a professor, I provide my students with the opportunity to engage a course’s content and expand the limits of their knowledge and abilities. Through the design of the coral reef ecology course, I emphasize a deeper understanding of fundamental biological processes and theories. I also seek to inspire my students with a passion for the material that will sustain them through the hard work that field courses require, and to connect their coursework to the world outside the classroom. I have taught a wide variety of courses in general biology, marine biology, invertebrate zoology, ecology and marine botany and trained volunteers in coral reef survey methods in Latin America. My research has focused on the behavior of herbivores in the marine environment: sea urchins (Diadema antillarum) and herbivorous fish on coral reefs and green sea turtles (Chelonia mydas) and herbivorous fish within seagrass beds. My interests focus not only on the ecology and physiology behind these behaviors but also the conservation of these ecosystems. 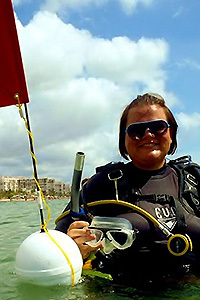 I am a trained phycologist, studying the macroalgae populations in Mexico, Panama, Florida Caribbean and Persian Gulf. Lacey, E.A., Collado-Vides, L. and Fourqurean, J. (2013 in review) Differential megaherbivore impacts on ecosystem structure and drivers to seagrass abandonment within a eutrophic, tropical seagrass ecosystem. Lacey, E.A., Fourqurean, J. and Collado-Vides, L. (2012) Increased algal dominance despite presence of Diadema antillarum populations on a Caribbean coral reef. Bulletin of Marine Science 89(2): 603-620.